~ Fantasy Adventures® - includes four 18" dolls and 2 boy dolls, made of high-quality vinyl, complemented by a full range of fantasy and historical clothing. Doll Trunks, Doll Stands, Hangers, Jewelry, Doll Bags & Shoes are some of the accessories we offer. ~ Girlfriends Collection® - includes contemporary and historical dresses, costumes and accessories designed exclusively for 18" American Girl® Dolls. 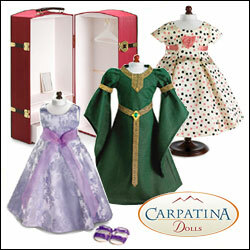 Carpatina Dolls are available at the Carpatina website (www.carpatina.com) and at selected specialty stores. 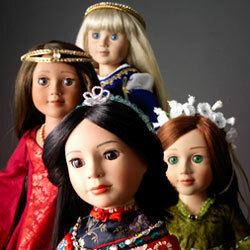 The dolls have a suggested retail price of $79 to $124, with accessories and dresses ranging from $8 to $65. Carpatina LLC also manufactures and distributes fine Medieval and Renaissance fashions. Special offer: Free freight on the first time orders of $500+ (this offer excludes the Doll Trunks). Click here to see some of the products CARPATINA has shared with ToyDirectory and TDmonthly Magazine.